Living in the country has more advantages than disadvantages, but every now and then you get reminded about a few nuisances you’d rather not have to face. The fact that countless creatures own the woods and they creep out mostly at night is something I rarely think about, but I am aware of the howling coyotes and the hooting owls each time I take my two pups out before bed. Before going out into the darkness, we make sure to turn on plenty of light and to make our presence known. My 10 pound pup Domino gives a few snorts and ruffs and does a kicky thing with his feet as if he were a thousand pound bull ready to charge. Little Dolly is only five pounds so she is a bit more timid and will not go off the porch steps unless I go first. I have never seen a coyote though I do see deer, and I have seen a few hawks, an eagle, and *ulp… possum, but I’ve not seen those creatures who make the eerie noises in the night. I don’t drive after dark very often, but a couple of years ago my daughter in-law and I were driving home in the dark and as we came around the bend, we spotted something in the middle of the road. I had cautioned Stephanie to always drive slowly at dawn, dusk, and dark because that’s when deer cross the roads. We came up on the curve very slowly and just then, in the high-beam of my headlights, stood a full-grown stag in all his glory against the black night! He was on the left side of the road standing as still as a statue and I was inches away. He was magnificent! It was winter and his steamy breath was visible in the cool air. In the moment, Steph nor I uttered a word as my Jeep crept slowly by. After we passed, I exclaimed to Stephanie, “Did you see that? !” and we both let out our breath. “I sure did!” We giggled with delight and just a tad bit of fear. That was a most exhilarating thing for me to be that close to something so powerful yet so beautiful. 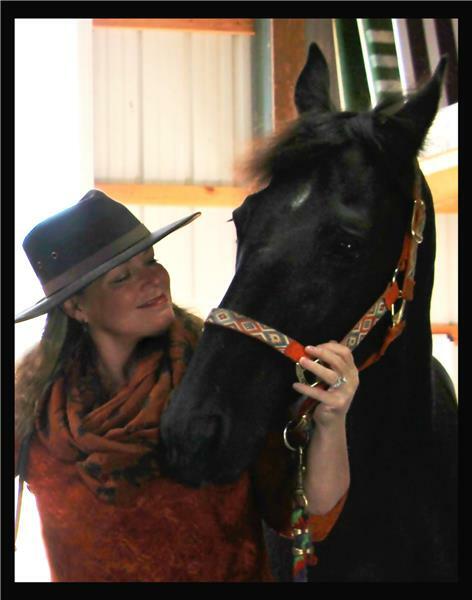 Of course being a horsewoman, I am near powerful, beautiful animals daily – but not with a huge rack on top of their head! Though taking care of horses brings a few adrenaline ridden moments as well. Two weeks ago, while the horse flies were still a buzz, I was in the feeding station at our ranch bringing grain to their buckets. Smokey, my oldest horse (and shared soul) is never any trouble. Suede is also pretty calm though she is only four; but Legend (also four) is a bit mischievous. Maybe that word is unfair - he is just ‘curious and untrusting’. Not qualities you want in a horse, but his good qualities outweigh the others. Legend is a Tobiano (paint) color Tennessee Walker. He has crystal blue eyes and his dark markings make him a very beautiful horse. He doesn’t like to be sprayed down for flies, so I leave him to his own defense with his swooshing tail and his swift running legs and the run-in sheds, but I am able to spray down Smokey and Suede – they actually welcome it. With fly spray in hand I headed over toward Suede but had to pass Legend. I always place my hand on his flank to let him know I am going behind him and THWACKK!! He kicked my right hand quicker than I could pull it away or even back away from him. It hurt bad. My hand was throbbing so much, I thought it may have been fractured. This did not help my confidence around Legend. I don’t think he was trying to hurt me, I think he just wanted to remind me that he didn’t want any fly spray. After getting it checked out and icing it, my hand was fine with a wound that turned into a two-week scab. I’d like to say all was well after that, but the following week leads this story back to the creatures in the night. Early one morning, I had to be at the dentist’s office so my son Nathan fed the horses. He called me with bad news. He said that Smokey came to the feeding station with cuts and abrasions. He was afraid he had been attacked. Smokey was fine, and walking around, but he definitely needed care. I went to the ranch and Nathan held Smokey while I washed his front right leg. There were several deep gashes that oozed clotted blood. He had a few on two other legs too, but not as bad. His right ear also had an abrasion and scratch. It was so sore that Smokey would not let me touch it. I did my best to put a little ointment on it, but really could not coat it as needed. After cleansing his leg, I used a spray-bandage I had picked up at the supply store. That would stop the bleeding until my vet could come out the next day. I tried to give him Butamine (like Ibuprofen) but he wouldn’t take it. Smokey of course, was on stall rest throughout the day and night. We brought the others in too so they could all be together and to keep them protected from whatever it was that went bump in the night. This really unnerved me, because I wasn’t sure what was out there and we have goats, a pig and two dogs at the ranch. I double checked that there wasn’t anything that could have cut him up laying in the field, but I knew that was impossible. We had just finished two projects over the last two years making the pastures safe and sturdy with a new wooden fence and the feeding station. No wire, no metal – everything was clean and safe in the field. As my son and I talked about what could have happened, we googled about wild animal trespassers and read that it is unlikely for anything around here to go after a horse like that – and if it did, it would ‘learn its lesson’ with a thousand pound animal fighting back! But a fluke can happen, and I had heard reports of some big-cat sightings in our area. For a bob cat or mountain lion to attack a horse still seemed questionable to me, but there seemed to be no other explanation. The only thing we could figure, is that perhaps whatever it was, was going after our goats while crossing Smokey’s pasture to get to them – and Smokey went after the creature, protecting his herd. Smokey fully trusts me and there is an immeasurable bond between us. I spent two hours in his stall singing to him, brushing him and hugging him. It brought back memories in Chattanooga when I would visit Smokey at Hidden Hills and spend hours just brushing him and loving on him. One day I sang him to sleep in his stall! He was so relaxed while I brushed him that he had to lie down. Horses usually don’t lie down around people – unless there is great trust, I knew then Smokey trusted me completely. I trusted him too. I felt very fortunate last year to bring him here at my Kentucky ranch and make him mine. As I brushed Smokey and kept singing, hoping to relieve him of any pain, he looked so sleepy that he might lie down for me again. I kept singing and he was nearly there ready to lie down, when my son pulled up and brought Smokey to full alertness. I just loved being with him and being there for him. The next morning couldn’t come soon enough. When my vet arrived, she looked Smokey over and of course asked me about any barbed wire or metal that might be in the field. I reported to her that there was nothing. She was just as dumfounded as we were as to what could have happened, but she did not rule out that Smokey had been in a fight with a wild animal. She had to sedate him in order to look at his ear. It mostly looked rubbed raw with a few scratches. She thought one scenario might be that he had colic and was thrashing about, (for those who don’t know what colic is – it is where a horse has a bad tummy ache and since they can’t throw up, their intestines twist up and this can be fatal) but the gashes on his leg really looked like claw marks and Smokey was eating fine. I also use a supplement for my horses that promotes a healthy gut, so I felt that was unlikely – especially with a clean pasture with no debris. This simply had us wracking our brains trying to figure out what exactly had happened. After my vet was able to put cream on Smokey’s ear, it was instantly healing. We had him on a steroid and Bute for a few days while the swelling went down and Smokey is now back to normal except for his cuts that are still healing. Needless to say, it gave us a fright and it broke my heart quite a bit, but these are things a country girl will have to face from time to time. God’s beauty is found in all areas of the world, but I am so glad He placed me in the peace and serenity of the country. Surrounded by open fields which host glorious sunrises and sunsets, watching deer cross through a cornfield, listening to the sounds of nature as it greets the day and bids us good night… these are just a few of the things that make everything right, in a place of hidden creatures in the night.